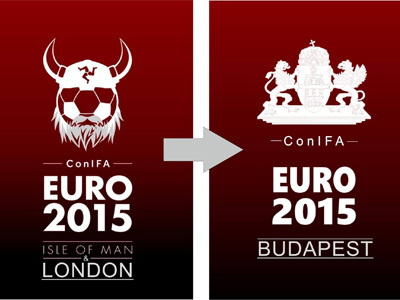 It is a pleasure for ConIFA to announce – together with MIFA – the participating teams of the first ConIFA European Football Cup 2015, which will be played in Douglas, Isle of Man. The ConIFA European Football Cup (EFC) will be the first ever European championship between representative teams outside FIFA. With 12 teams participating it will have the same size as the first World Football Cup had 2014. This clearly shows how popular and important football outside FIFA in Europe got over the last few years. All matches will be played from the 13th till the 21st of June in the stadium “The Bowl” in Douglas, the captial of the Isle of Man. During the last weeks and months ConIFA worked hard to ensure and formalize the participation of 12 very valuable teams. Until today we can confirm 11 teams that qualified for the tournament and were happy to accept our invitation. The last participant will be announced before mid-January. Ellan Vannin – As the host and the current ConIFA vice World Champion team Ellan Vannin was always clear to participate. The team is preparing on a regular basis already and has to be one of the favorites to go all the way with their amazing fans. After thousands of fans watches the ConIFA World Football Cup final live in pubs on the Isle of Man they can see and support their team live now, which might make them even stronger. Nagorno Karabakh – The Artsakh national team was considered by many to be the underachievers of the World Football Cup, where they got the most tricky draw in a group with the 2 later finalists. Now the team and the management is itching to bounce back and proof that they are on of the top teams outside FIFA. Nagorno Karabakhs team surely is on a high technical level and can probably outscore any opponent on a good day! With less expectations and pressure the team might be even stronger now. Abkhazia – The Abkhaz national team finished just 7th at the World Football Cup and remained unbeaten over 90 minutes before their last match against Occitania. Only penalties could stop them on their way in Östersund as they always attacked from a very stable and secure defensive line. Surely playing Abkhazia is not the easiest task for any of the competing teams and we will see if the luck is more on their side now. South Ossetia – The South Ossetian national team was the biggest surprise of the World Football Cup reaching the semi-finals in the end. Before the WFC the team never won a match (only heavily lost against neighboring Abkhazia) and then went all the way to get 4th in the end. Now it is time to see if the team can remain such a powerhouse within ConIFA and can perform again during the European Football Cup. Occitania – The Occitan national team became stronger and stronger since their foundation 10 years ago. In their very first tournament participation – the “VIVA World Cup 2006” in Occitania – they heavily lost against Sapmi and even lost vs. Monaco. Last year – in the first ConIFA World Football Cup – they only lost in penalties to Aramean Suryoye and Kurdistan and remained unbeaten elsewhere. Surely Occitania is on their way up – in the rankings and in the public view – and we are sure they will remain strong on the Isle of Man, too. Romani People – The Romani People team will be the dark horse of the tournament. As the team never played until today and the squad still has to be casted amongst Romani People from various countries it is hard to estimate their strenght. Most of the players will probably come from Germany, where the management is based, and play within the lower divisions. We are all very eager to see the quality level of the Romani team and of course meet this new member on and off the pitch! Franconia – Another dark horse is coming from South Central Germany: The “Franken XI” representing Franconia. Until today the team only had one match – including 3 former Bundesliga professional players – and won against Raetia 3:2. This still makes it hard to estimate the strength of the team that they will bring to the EFC. We are all looking forward to see how they do and meet the team! Sapmi – The Sapmi national team is a classical favorite of every tournament outside FIFA with a huge scarce from recent history when they finished only 10th in their home World Football Cup last year. Sapmi is of course eager to proof that they still are a strong team and that they can do much better than they did in Östersund. We are very excited if they can get back to old strength and are certainly happy to welcome the great Sapmi people on the Isle of Man. Northern Cyprus – The Northern Cyprus national team will give their debut within ConIFA, but are also one of the highest profile teams outside FIFA. Until today the team played 6 international tournament, won 4 of them and only lost 4 times in their long history and only once against an European team! Looking back to this vita surely Northern Cyprus has to be seen as one of the top favorites to lift the trophy or at least go very far on the Isle Of Man. Szekely Land – Szekelyföld FA is one of the youngest ConIFA and will send a team to a major tournament for their very first time next year. Their young history showed a heave 0:6 defeat to the Hungarian first league team Debreceni VSC and a 5:0 win over “FC Beregszász Kárpátalja” from Ukraine. Many of their players are semi-professional footballers within the leagues of Romania or Hungary and we are sure they are no pushovers at all and might surprise a few.
? – There’s one team to be chosen from the reserve list.